When we imagine early astronomy from ancient times to the medieval we assume that lacking optical devices they would see only pinpoints of light fixed in their place all eternity. Sure they would have noticed that the Sun and Moon moved across that backdrop, and these stars would make interesting patterns, but that’s about all the naked eye could show you, after all we wouldn’t see much more today. Then I realised that until relatively recently the skies were really dark. Consequently the night sky would have been far more dramatic and dynamic to the ancient eye than it is to our own. Modern skies are so bright that it’s easy to fail to notice there’s anything up there at all, and most don’t even bother to look. 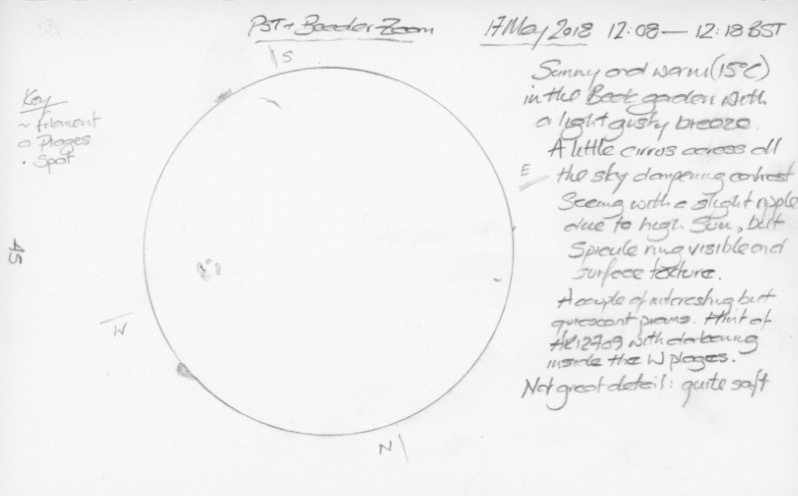 The Sun and Moon are bright enough to be seen in the most light polluted sky, but the planets all the way out to Saturn are bright enough to be easily visible to your eyes, and although their true nature might not have been known they were named and their strange paths commented upon: these were not normal stars! The rugged bright band of the Milky Way moves across the sky with the seasons being right overhead in the late summer and autumn at mid-northern latitudes. In the dark it casts a shadow so I’m told and is a mosaic of dense starlight and dark dust clouds. They certainly noticed that the patterns of stars that give rise to the constellations also move throughout the year and gave many of them names. The fact they managed to pick these stars out of the dazzling background shows that they were really observing. Several stars were singled out as having special significance in connection with seasons. To cap it all some of the “unchanging stars” were seen to vary in brightness, such as Algol (beta Persei), and new stars would very occasionally appear in a dazzling flash that would become known as Novae or Supernovae, such as that which created the Crab Nebula. Comets would have been more noticeable and invested with the power of victory or doom. I can only imagine how spectacular the regular meteor showers would have appeared. I would love to experience those skies, but I really don’t like to travel and few places in the World remain where you can see what the ancients might have. All the same much of what I’ve mentioned is available in a diluted version to modern unaided eyes (well perhaps with glasses). I’d urge you to try really observing the Moon and see what you notice; have a go at making brightness estimates for variable stars like Algol; try splitting some wide double stars and see what’s the closest you can manage; and examine the large scale structure of the Milky Way. You don’t need any equipment to be an amateur astronomer. I think it’s fair to say that I was more active on the blogging front in 2017. Unfortunately I appear to have fallen off the wagon again, so I’ll try to get things rolling with my traditional summary of the last year. I’ve a few more ideas after that so who knows? Going back over the diary for 2017 shows about a third of the nights to be observable based on my loose definition. Chart of the monthly figures for the nights I decided were suitable for observing and those I actually went out there. I feel that the duration of those “clear” skies opportunities have declined, especially in the autumn, a point born out by notes in the diary. There’s no doubt that the quality of my home skies have been in decline for some time due to atmospheric moisture and the rising light pollution from the nearby industrial estates. Many of those months make great use of the fact that the Moon is quite observable in even relatively cloudy conditions, and the light pollution doesn’t matter one bit. In fact I normally observe the Moon with a bright white light to illuminate my atlas and journal. I have indeed started lunar sketching in the last year… but not well enough to share yet. At the close of the year I’m down to the final ten sights in the Lunar 100, and some of those will need just the right libration. The Herschel 400 (H400) list is actually the Herschel 281 for me since I’m limited to objects above the celestial equator. It’s gone reasonably well since I started it last year with 92 objects observed despite the poor deep-sky conditions. I have pretty much run out of Binocular Messiers to observe from my garden and started on the low altitude Summer Messiers. I’m about a third of the way through this project and progress has been very slow. Variable star observations topped 1300 at the end of the year and I did receive my certificate from the AAVSO for my first 1000. I was aiming for 1500 in 2018, but that’s going to have to be revised… I hope. 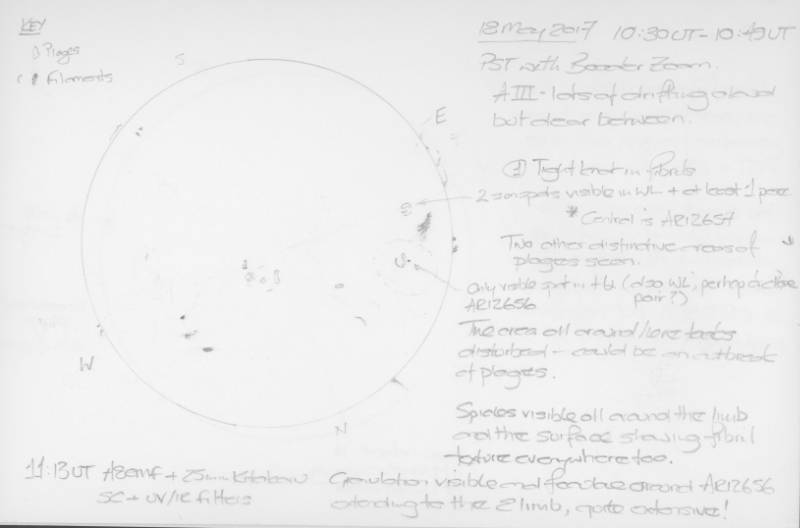 I’ve been just as active as in 2016 but with a lot more sketching in both Hα and white light using the Herschel wedge… and cheap binoviewers which are excellent for white light in my Starwave achromat. 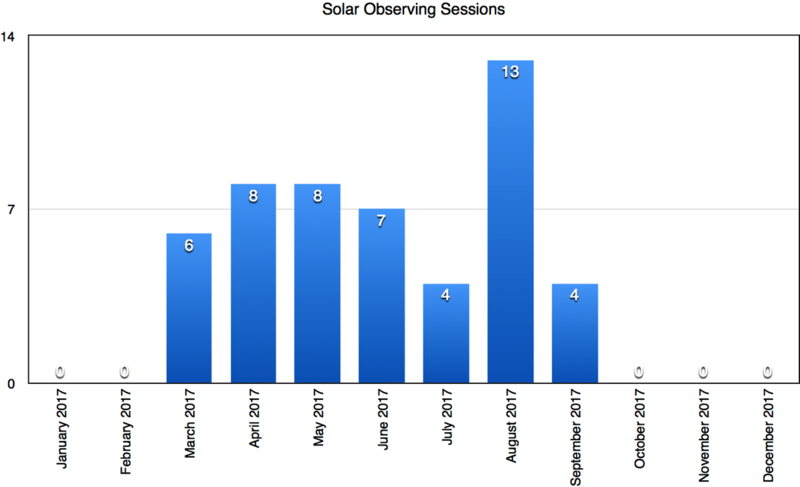 Chart of my solar observing activity in 2017. OK, not quite as many sessions as a packed 2016, but I felt that the quality of the work I was doing was much higher. Most sessions had a sketch and detailed notes. To be frank it’s not started well. Lots of poor weather and a prolonged illness have made it impossible for me to get any scope time for the last month. Unfortunately I’ve now observed many of the fun objects in the H400 and there are a lot of galaxies remaining. I’ll admit that I’m not a big fan of galaxies. This is partly being limited to 150mm of aperture, which I may able to do something about, but also the poor quality of my sky: any haze and glare makes galaxies invisible. I’ve kicked off a couple of new programmes focused on objects visible from my home site to make up for a galaxy infested H400. The resurrected and revised version of the Astronomical League basic open clusters programme containing 88 clusters. A programme to observe 56 bright planetary nebulae. I have another that may prove to be insane from my garden: 34 objects from the Sharpless HII Regions catalogue. They’re the ones that Stewart Sharpless gave a ‘3’ for Bright, though I suspect that to be a relative term. We’ll see how that goes, I may have for travel far afield to complete it, or leave the Country. I want to finish off the Binocular Messiers but I need to find a better horizon. I have a few ideas that are considerably more local than those for the Sharpless project and at least binoculars are nothing if not portable. The majority of the outstanding Messiers are spring and summer objects, so I’ll need to get started soon. Lunar observing is guaranteed to continue. The final few Lunar 100 sights may be a question of waiting for the right opportunity, but I’ve identified a few features of special interest to pursue, research and perhaps even sketch well in the process. I’d like to try and observe Venus a again this year, but the apparition isn’t very favourable, just better than for all the others. I caught a brief glimpse in binoculars last night at only 5º above the horizon: no chance of getting a scope on it. The planets are mostly hopeless this year I’m afraid. 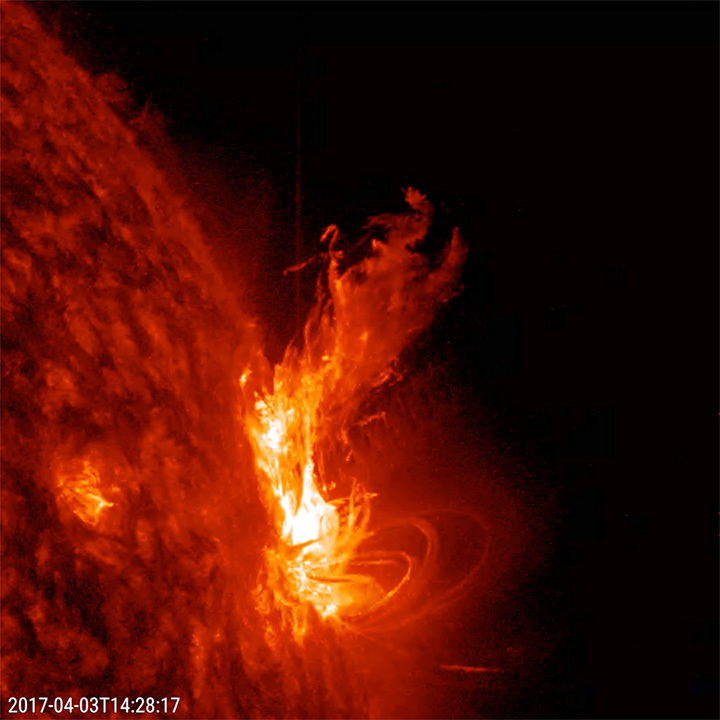 We march towards solar minimum in the next couple of years, and despite some fireworks last year the beginning of this one hasn’t been promising. The Sun is very quiet. 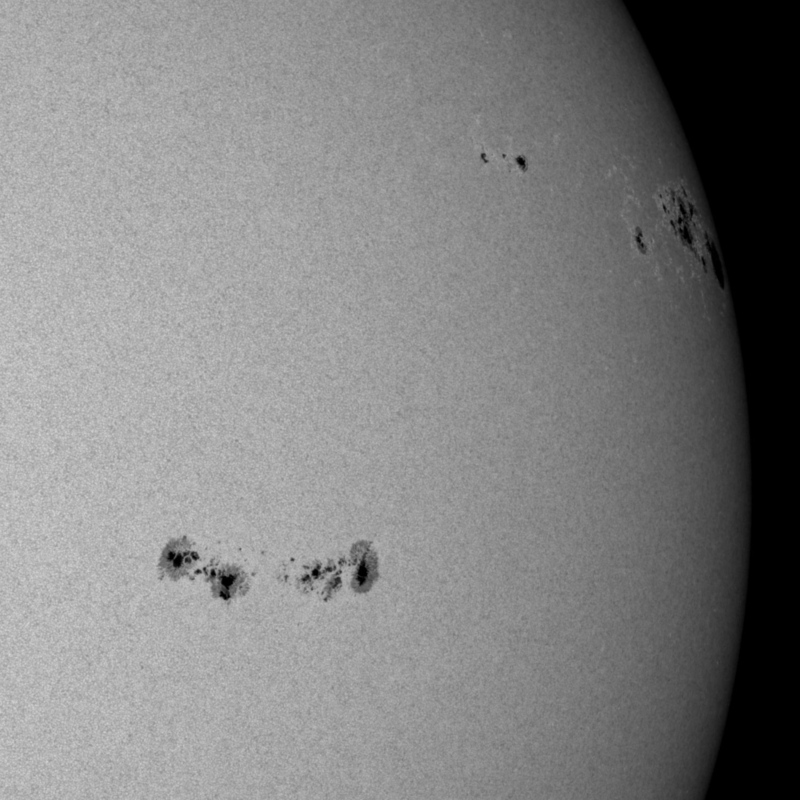 Is this the right time to start learning how to do sun spot counts? I hope for better by the summer. Back in February I noted that most of the remaining Messier Objects were too low to be seen from my back garden. Well I managed to fit an observing session in during one of our Society meetings to observe the Perseid meteors this August. As it turned out it was cloudy most of the time, so very few meteors were seen, but during the early part of the night, before the Moon rose, I stuck my 10×50 binoculars on their monopod and pointed them low to the South in the direction of Sagittarius. 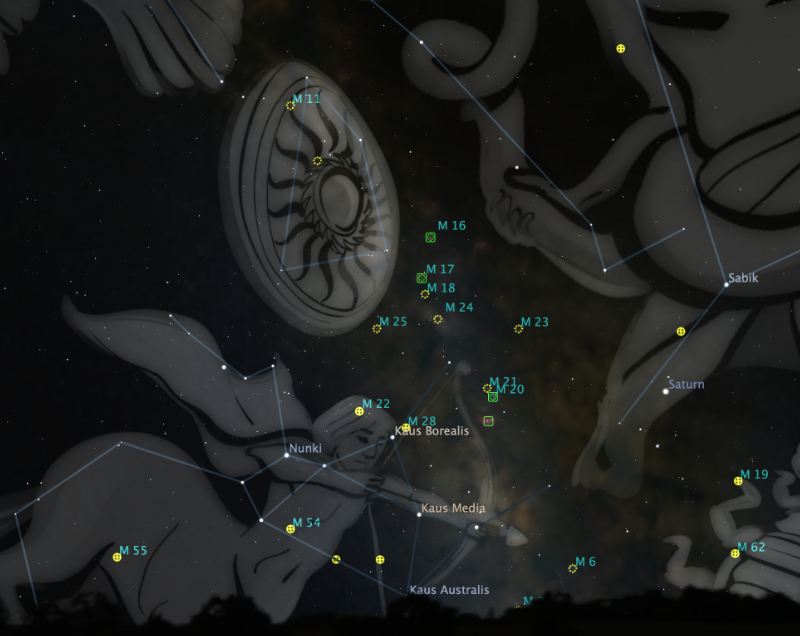 View of the Messier Objects in Sagittarius and Scutum produced with Stellarium. As you can clearly see there’s a lot to go at here! Unfortunately, even from this site trees obscured anything below the star Kaus Borealis marking the tip of the lid of the Sagittarius teapot. I could get pretty close and that star was a nice bright marker, so I decided to begin with M22. It was immediately obvious to the East of Kaus Borealis and well clear of the trees. A large round fuzzy patch with no sign of resolving into stars. Just what you’d expect from a globular cluster in a pair of binoculars, or in fact in a small telescope. I panned to the West, but as expected M28 was not seen. It was obscured by the tips of those trees. I was keen to bag the lowest of the objects on view, and typically enough the next target isn’t marked in the image above. I chose M8 (the Lagoon Nebula) which is that box below M20 and to the West of the last targets. 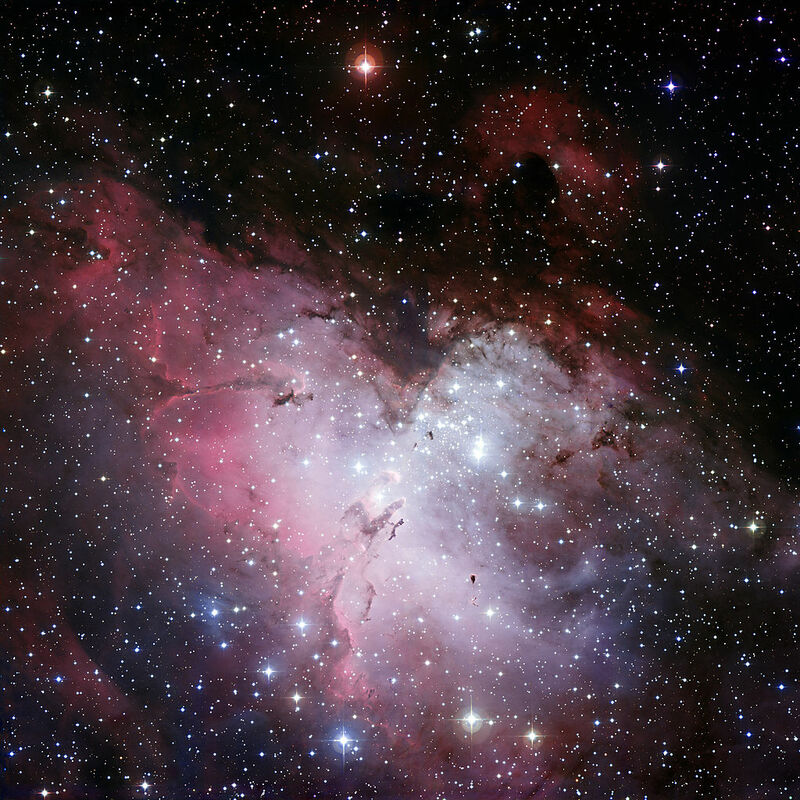 M8 was seen amidst a collection of brighter stars aligned east-west as a patch of nebulosity in direct vision. It’s nothing but a fuzzy patch which was about 7’x3’ in size when compared to the separation between the adjacent stars 7 Sgr and 9 Sgr. Truthfully, I suspect that I was primarily seeing the open clusters NGC6530/6523 forming within this emission nebula as they match the position of this patch. M24 is an interesting target, and one made for binoculars. That’s because it’s the Sagittarius Star Cloud: a view through an interstellar dust cloud of the neighbouring galactic spiral arms. It’s a large and very obvious grouping of stars of various magnitudes, there’s nothing nebulous about this one! It spanned about ¼ of the binocular field of view, or about 75 arc-minutes, in its length and perhaps ⅓ of that in width (25 arc-minutes). It’s aligned roughly northeast-southwest. I wondered whether I could find the open clusters in Scutum. Being the brightest M11 was the first on the list using the stars of Aquila as a signpost (Scutum isn’t very bright). To my surprise there it was as a modest sized, but bright condensation of stars. It was immediately obvious, but I couldn’t resolve an stars with the binoculars. I’ve managed to get a telescope on M11 from Home since and it’s a spectacular open cluster! Down and to the West I sought and found M26 which was much smaller and fainter than M11. Definitely no stars to be seen in this one, and I haven’t viewed it telescopically yet. I’d taken to starting my star hopping at M24 because it’s so obvious in binoculars, and fabulous to look at too. This time I noticed two more fuzzy patches to the northeast as the transparency improved. The first spherical patch of nebulosity appeared above a convenient asterism allowing me to identify it as M18. Nebulous and unresolved I estimated it to be about 8 arc-minutes in diameter by comparison to the local stars separations. Further to the North is a much more irregular patch in the right place to be M17 (the Swan Nebula). Again this was nebulous and unresolved. M16 (the Eagle Nebula) spotted as a nebulous patch around a coarse cluster of stars that formed a suitable pattern for a positive identification. No detail seen, but it’s clearly visible whilst not resolved. I estimated it to be 5 arc-minutes in size. These two objects are star forming in that dust cloud mentioned earlier. Without it the whole area would be as star filled as M24! On the other hand we wouldn’t have objects like M16 to look at, even if it didn’t look like that in my 10x50s. Finally for the night I found M25 easily spotted to the East of M24 as a coarse and sparse open cluster that did resolve fairly easily. 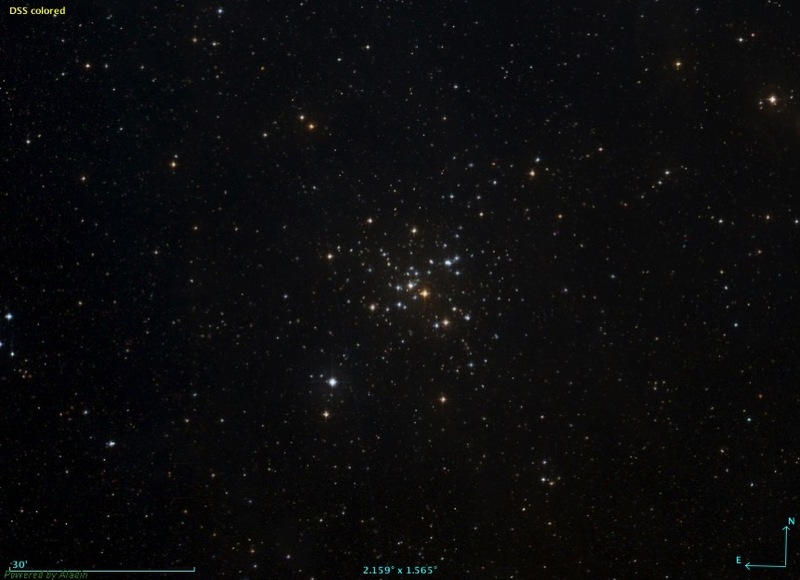 A range of magnitudes leads me to assess it as a Trumpler class II2m open cluster. And that was the end of a very good night’s work with the binoculars. Nothing I viewed that night was particularly taxing, many other Messier objects are much trickier. It’s a lovely part of the night sky and there are more to capture here, but I think that’ll have to wait for next year as time and the weather have not been kind. Since I last posted the rest of February 2017 has happened… there’s not a whole lot more to say than that. Last month wasn’t quite as bad as last June, but it came perilously close for a while. It’s been cloudy and wet most of the time, but I’ve managed to grab a handful of brief sessions with my smaller scopes. The fact that the Moon is lovely and high at this time of year has been helpful, though many of the best opportunities have been around New Moon ironically. I say that because there’s a theory that it’s only ever clear when the Moon is in the sky. Admittedly it’s a theory of Deep-Sky observers, but we couldn’t complain about that too much this February. Still the skies weren’t Deep-Sky clear: the Transparency has been poor due to the high levels of humidity. I believe that the unseasonable warmth is a problem since the moisture hasn’t been forced out of the local atmosphere by sustained freezing temperatures. I’ve often been out observing at midnight at temperatures around 10ºC this winter, and that isn’t normal from a long term historical perspective. The beautiful twinkling stars are a really bad sign for the observational astronomer. They’re symptomatic of poor Seeing and I suspect the polar Jet stream has been a frequent visitor overhead. When this happens everything is blurred like you’re viewing it at the bottom of a swimming pool. So seeing small features on the Moon or planets is out, and so is splitting tighter double stars. So I’ve spent February as a bit of an astronomical tourist, just visiting the brighter Messier and NGC objects, the Moon and even Venus as the conditions allowed a half hour of clearish sky. No time for notes or sketches, I’ve considered myself lucky to get the telescope set up before the clouds reappeared. That’s been OK, though rarely as relaxing as a quick tourist session should be, but it’s also frustrating when my Herschel 400 project has stall, the remaining binocular Messiers are a no-go, and my Variable stars are nearly a month overdue. Let’s hope for kinder weather in the coming Spring before British Summer Time (BST) arrives and the Solar season is upon us. Author JamesPosted on March 2, 2017 Categories ObservingTags thoughtsLeave a comment on What a February! You may remember way back in 2014 I wrote about Charles Messier and his list of comet-like objects. I also mentioned that I’d started tracking them down with binoculars, and that was a while ago, so what’s happened since? I’m still working to my usual leisurely pace, but I’ve collected good observations of 60 of them now. This year would be a great time to finish this project since it’s the 200th anniversary of Charles’ death. The BAA are encouraging observers to complete a Messier Marathon, or at least view all the objects this year. Perhaps I will. 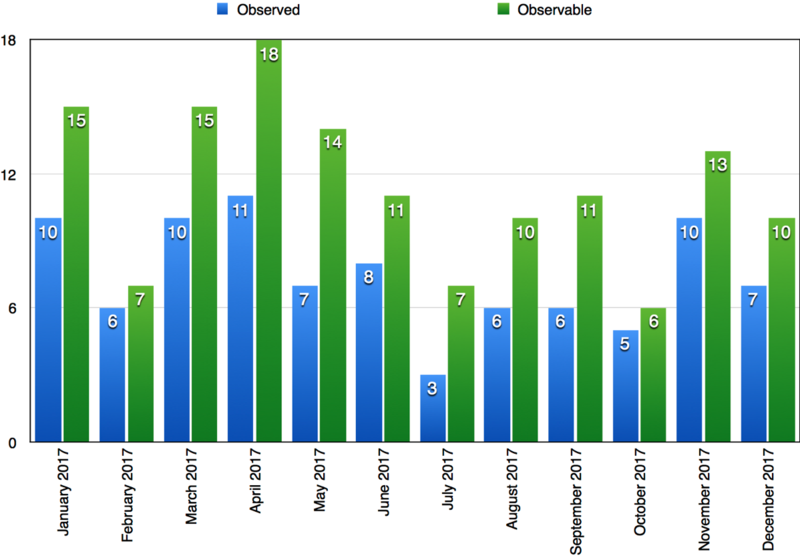 I’m basing my work on the Astronomical League’s Binocular Messiers Program that rate 102 of the 110 to be observable with binoculars. I’ve set the additional challenge to observe as many as possible from my north-west facing back garden. This is one reason why it’s taking so long to complete the project: some objects have a very short window of opportunity. That said, I seem to have managed a couple they don’t think I should be able to see, but I stand by my observations ;-), and having observed 58 from their list have 44 left to go. Unfortunately most of those are pretty low in the sky from the UK. For example, I snagged M41 in Canis Major a few nights ago as it briefly appeared from behind the row of houses before falling into the trees, and all whilst standing on top of a wall peering through the undergrowth. On the other hand I couldn’t have done that with a telescope! I’m very glad that M41 is big and bright or the Industrial Estate light pollution would have rendered it invisible. Image Credit: M41 taken from the Digitized Sky Survey (DSS) using Aladin Sky Atlas. The upcoming galaxies of Virgo and Coma Berenices may cause some problems. I’ve observed all the brighter ones and have the trickiest to collect on a night of really good transparency. I’ll have another go at M108 and M109 in Ursa Major on that night too. Then I’m down to the horizon huggers of Scorpio and Sagittarius below 25° altitude. I can’t think of anywhere around my house that they’re possible. Not the street outside, our front bedroom window, they’d probably be difficult from the roof. So I’ll have to start being mobile to mop the rest up, and perhaps that’s the time for a marathon?